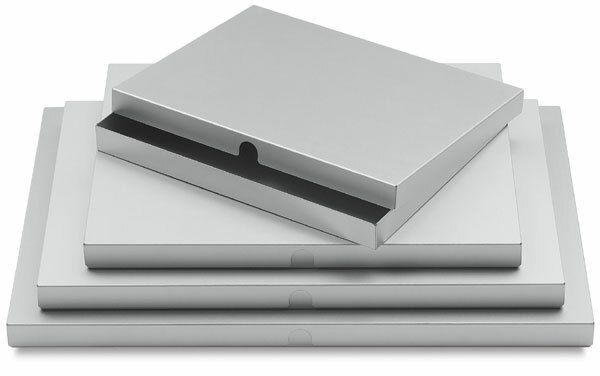 Pina Zangaro's Presentation Boxes, made of anodized brushed aluminum, are a sleek presentation alternative. They're fully archival, so they're also great for storage. The lift-off lids have finger notches on the sides to facilitate removal. Anodized aluminum is durable and scratch-resistant, so these boxes will maintain their appearance and style for years to come. For an even more dramatic presentation, consider customizing your presentation box with your logo, name, or other artwork of your choosing. Available in two formats — Color Imprinting and Laser Etching — custom imprinting makes a lasting impression. Color Imprinting — Using its state-of-the-art digital flatbed UV printers, Pina Zangaro prints logos, names, or other art, including half-tones and photographs, in brilliant full color on the lid of your presentation box. The ink is UV-cured and permanent. Laser Etching — Pina Zangaro uses CO2 lasers to etch names, logos, and other art on its aluminum presentation boxes by removing a thin outer layer of material. Laser etching creates a slightly textured, permanent impression of your art. For custom imprinting orders, your art must be emailed directly to Pina Zangaro at imprinting@pinazangaro.com. DO NOT mail your artwork to Blick Art Materials. Imprinting is only available for presentation boxes purchased online. Click here for detailed instructions on how to submit your artwork, as well as information about reviewing and approving your proof. Any delay in submitting your artwork to Pina Zangaro will result in a delay of your order being processed.